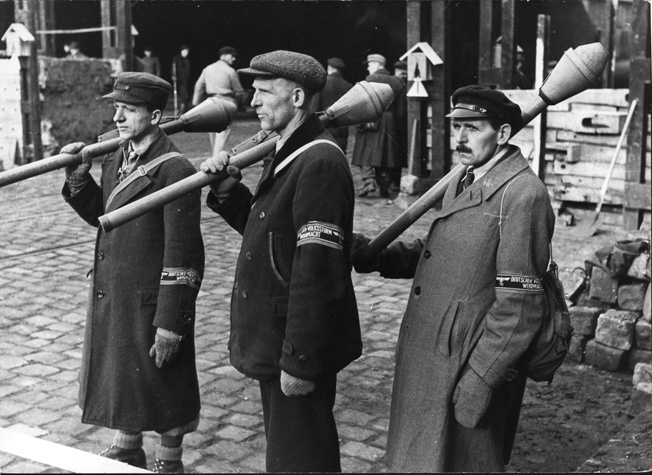 During 1944-1945, the Volkssturm, or People’s Militia, was designed to promote “a violent burst of fanatic rage against the invaders” and thus salvage victory. On October 18, 1944—the 131st anniversary of the Battle of the Nations’ victory over Napoleon in 1813—Reichsführer-SS (National Leader) Heinrich Himmler stepped up to a microphone to make a national radio address announcing the formation of the Nazi Party-controlled Volkssturm, or People’s Militia. Standing with him was the new Chief of the General Staff, General Heinz Guderian; Dr. Hans Heinrich Lammers, head of the Reich Chancellery in Berlin; and Gauleiter (Regional Leader) Erich Koch. The site of the address was at Bartenstein, East Prussia, on Koch’s turf, and he was already organizing his own local forces to fight the Red Army coming from the East. Indeed, conjuring up images of the 1813 War of Liberation against the defeated French, the new VS had already won its first victory over the Soviets on October 7 at Memel, Lithuania, which the Nazis had taken in 1939. Guderian had come into office the day after the failed bomb explosion to kill Adolf Hitler, and the latter had virtually lost most of his faith in the regular German armed forces to win the war. The radical Nazis—Dr. Josef Goebbels, Dr. Robert Ley, Himmler, and most of all Reich Leader and Secretary to the Führer Martin Bormann—were urging Hitler to turn to the very force that had brought him to power in the first place: the Nazi Party and its various organizations. What all of them feared most was a second 1918-style collapse of the German state from within, an internal-type revolt that had toppled Kaiser Wilhelm II when the German Army was still fighting in the field on the Western Front. It was their belief that the Party had rebuilt the state from that catastrophe starting anew in 1933, and now—11 years later—a similar program of rejuvenation was to be the order of the day. With a Wehrmacht soldier serving as a backdrop, this wartime poster depicts an SA man handing a rifle to the older civilian at right, who is competing in a marksmanship contest. Trained and outfitted by both the Nazi Party and the German Army, Hitler hoped the Volkssturm, or “People’s Militia,” would fight to the death to save the homeland. This time, there would be no home front failure, and thus on September 25, 1944, Hitler, through the use of his familiar “Führer Decree,” announced the creation of the Volkssturm and Himmler’s control of the organization; Bormann would be in charge of the administrative issues. Thus, right from the start, there was the divided leadership that would plague the VS until the very end of its days in the defense of smoldering Berlin—in which it played at least half a part. Hitler, like his rival, U.S. President Franklin D. Roosevelt, had the leadership style of giving several different men the same functions, believing that competition would make them perform better and get the overall job done faster. This was also the overall leadership principle of the Nazi Party as a whole. The key individual, from inception to ultimate VS demise, was Bormann. In his unique position of being at the Führer’s elbow night and day, he had Hitler’s ear on virtually everything and thus was able to convince Hitler to create the VS along the lines of the 1813 Home Guard, and also to place it under Lammers’s Reich Chancellery. Bormann believed that only the Party could run the VS properly and ensured that service in it was mandatory for all civilian German males between the ages of 16 and 60. This included the all-important Class of 1928—those who would turn 17 in 1945—the 550,000 boys of Artur Axmann’s Hitler Youth, literally the final remaining military manpower pool of Nazi Germany. The older men—ridiculed as “Grandpas” by the younger generation—were veterans of World War I or those who had already fought in World War II and been wounded. A teenage member of the Hitler Youth distributes grenades to a motley group of Volkssturm troops. Some men carry panzerfaust antitank wepons, others outdated rifles. The VS would be organized on the model of the 42 Gaue, or Regions, of the Third Reich, all controlled by Bormann as virtual domestic dictator while Hitler ran the war. This had been the setup ever since Germany invaded Poland on September 1, 1939, and thus Bormann understood his task thoroughly, governing the Reich via teleprinter, telegraph, radio, and telephone from wherever Hitler’s “Führer Headquarters” happened to be. He would rule the VS through the Gau, Kreis (county), and Ortsgruppenleiters (town leaders). In Bormann’s mind, the VS would fight like the sturdy Japanese in the Pacific: to the last man, bullet, and breath. The nature of Bormann’s vision for the VS was unity overall, Party control, and formations based on the members’ place of residence. The last factor was all important in his view, as he believed that it was critical to the fighting success of the VS as a combat unit that would be called into action when the enemy arrived at the edges of their towns and cities, most of which had been officially declared “fortresses” by the Führer anyway. The Führer Decree of September 25 gave the Gauleiters the power to organize the VS in their domains, which included more than 800 counties in the Reich proper. The average age of those who served (the national oath-taking was conducted on November 12, 1944) was between 45 and 52, and Bormann—aping Hitler, here–– refused to call up women, unlike the Soviets. Of those men who were called up, most were white-collar workers, unaccustomed to the harsh life of a soldier in the field. On November 27, 1944, Himmler took command of Army Group Upper Rhine, thus making him Bormann’s first serious rival for power, as both wanted to succeed Hitler as Führer. Each reasoned that if they were able to win the war for Germany, they would accede to the mantle, and there was, indeed, some logic in their positions. As it turned out, Himmler’s tenure as commander was brief, as he proved to be completely incompetent in the position. Even though Bormann irritated Himmler by referring to the units as “my VS,” it was a top SS man—General Gottlob Berger—who was chief of staff of the Volkssturm and who reported directly to Himmler, not Bormann. Indeed, it was Berger who announced that the VS would be trained and ready for combat against the Russians and Western Allies no later than March 31, 1945. With dour expressions, three middle-aged militia members carry panzerfausts, which required little skill to operate, and wear Volkssturm armbands. 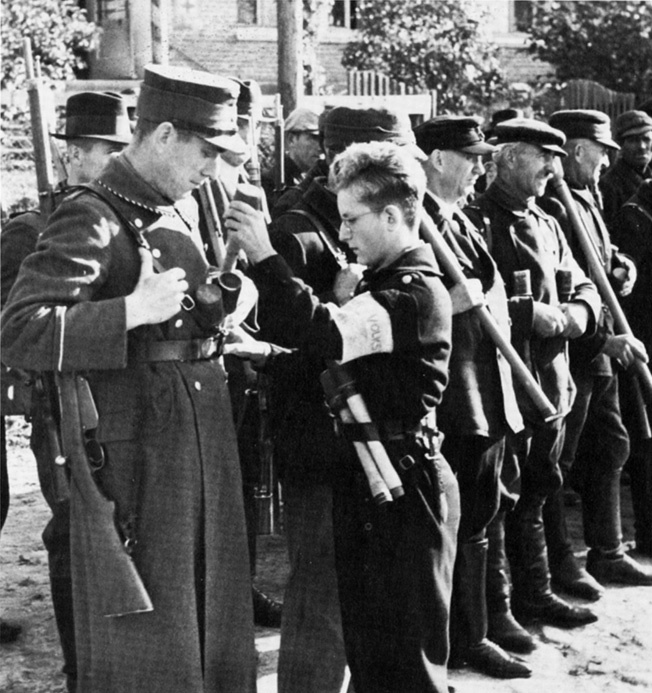 Unable to provide all VS troops with uniforms, the German high command trusted that the armbands would be enough to identify the wearer as a regular military combatant and not a partisan. In training, Berger wanted individual rifle marksmanship stressed for the civilian warriors, while Bormann opted instead for small antitank weapons with which to defeat the masses of Russian T-34s and American M-4 Sherman tanks. In the end, Bormann prevailed, and in this instance his view was militarily sound as events were to prove, especially in the defense of Berlin and other German cities. The citizen-soldiers trained on weeknights and for six hours on Sundays, and what rifle training was provided was given by SA Chief of Staff Wilhelm Schepmann’s brownshirted Stormtroopers. Schepmann had wanted a real wartime role for the SA ever since 1939, and he saw the VS as a way of achieving it at the expense of the SS (its hated rival since 1934), the Party, and the German Army (which it had wanted to replace as early as 1930). Hitler and Bormann, too, saw this danger, and they were not about to let Schepmann achieve an ambition that had eluded the murdered SA leader Captain Ernst Röhm in the Blood Purge of June 30-July 2, 1934. Thus, Schepmann would be allowed to arm and train the VS but not lead it. Nor would Dr. Josef Goebbels in his capacity as Hitler’s appointed Reich Plenipotentiary for Total War. Despite the famous wartime newsreels of the leather-coated propaganda minister reviewing VS troops passing on parade, his role with the Volkssturm was really quite minimal, except for exhorting them to fight for Berlin, of which he was Gauleiter. Then there was the National Socialist Motor Corps led by Erwin Kraus that provided courier motorcyclists and truck drivers to transport the VS men to their sites, as well as units of the Nazi Fliers Korps (NSFK). It seemed that every Party organization wanted its finger in the VS pie, and for a very simple reason, then and now still incomprehensible to those in the West: the Nazis believed that the war could still be won! 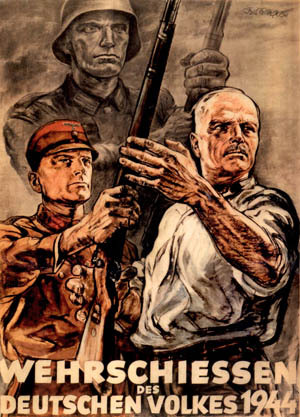 The citizen-soldiers of the Third Reich—indoctrinated as true believers—would also be fighting for their own homes and families on German soil, and the threat from the East also induced in the Germans of East Prussia the very real fear of Red Army retaliation for the atrocities that had been committed by the Germans in the USSR during 1941-1944. As one historian put it, “Wars were winner-take-all affairs.” To the Nazis, negotiations equaled weakness and surrender. In this respect, Hitler, Bormann, and Goebbels were far more “Nazi” than either or both Himmler and Reich Marshal Hermann Göring, who in the end in 1945 wanted to treat with the enemy. Thus, especially after the failure of the July 20 assassination attempt—when, in their eyes, the traitors had been unmasked—the Nazis wanted to renew—not end—the fighting. It is significant to note that more people in Europe died after July 20, 1944, than in all of the five years of war before it. To the Nazis, the VS was both a valid and rational response to the events of 1944-1945, just as the rise of the Party itself had been to the fall of Imperial Germany in 1918-1920. Indeed, if anyone’s morale would collapse, it would be that of the Allies, not the German people led by the Nazi Party under Hitler. Ironically, too, as the German armies retreated—and this included the battered Waffen SS as well—so, too, did the power of the Party increase within the borders of the pre-1939 Greater German Reich; thus, as Himmler lost power, Bormann gained it. By the spring of 1945, Himmler ceased to be a real factor in VS power struggles and was replaced in these battles by Hitler’s Minister of Armaments and War Production, Albert Speer, who was working hand in glove with the German armed forces—mainly the Regular Army—to prevent the Führer’s decreed “scorched earth” policies designed to make the Third Reich an industrial wasteland of no use to any conquering army. Speer—unlike hardliners Himmler and Göring—was not a true Nazi in the Hitler-Goebbels-Bormann mold and saw for himself a role as the rebuilder of the Fourth Reich under the auspices of the Western Allies at least. In the end, however, Bormann’s concept of the Volkssturm was undone by the very people he wanted to protect it from the most, and from whom he expected the least danger—the officers and men of the German Army in whose sphere of operations the individual VS units fell. The primary reason for this was that the Party simply could not and did not supply the VS with the weapons, uniforms, and supplies that it needed, while the regular military most often did. Wherever the VS and the military worked well together, the morale was good, absenteeism down, discipline maintained, and training heightened. Thus, much to his chagrin, Bormann was faced with a situation in which the Army delivered where the Party had failed. 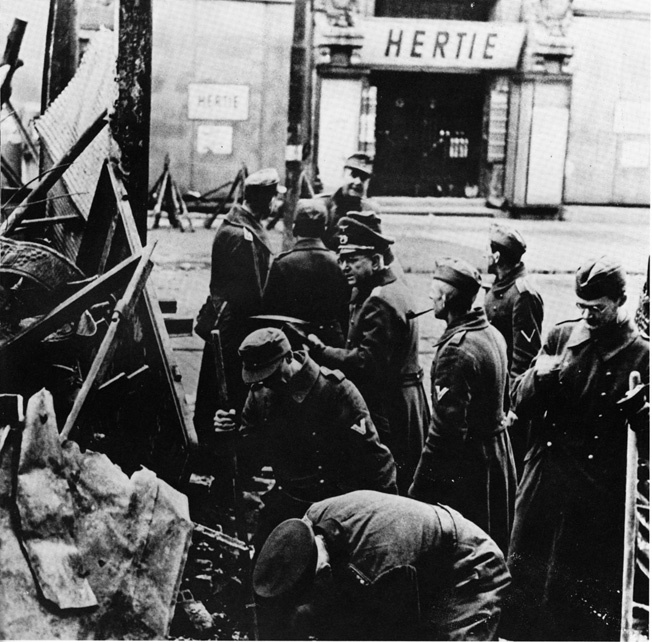 Under Wehrmacht supervision, Volkssturm troops set up a makeshift barricade in a Berlin street in hopes it would stop the advancing Red Army. The VS men shown here wear military uniforms, unlike many others who were simply provided an armband worn over their civilian clothes. The reason for this, too, was that—unlike the higher ranks of the officer corps, which was, by and large, monarchist in belief and background—the lower ranking officers and most enlisted men were Nazis to the core. To them, the attempt to kill Hitler on July 20, 1944, was a disgrace to the good name of Germany. Indeed, the Army was intimately involved with the Volkssturm from its very beginning. It was the Army that provided both the Panzerfaust (a shoulder-fired rocket similar to the U.S. “bazooka”) and Panzerschreck (“Terror of the Tanks”) antitank weapons that stopped many an enemy tank in its tracks. In the end, the Panzerfausts were the only weapons that were available to the VS in abundant supply for combat. One fear that all VS men shared was that, without uniforms, they would simply be shot out of hand by the enemy for being partisans or terrorists behind the lines, particularly if they were confused with Dr. Ley’s proposed postwar Werewolf organization. They also disliked the Party’s brown uniforms, as they feared that Red Army troops would be more likely to kill them and refuse to take them prisoner. Some even served in civilian clothes, overcoats, and hats, with but a Volkssturm armband and a pay book to identify them officially as Volkssturm men. Negotiations were conducted with the Western Allies to recognize the VS as true combatants, and these were successful, but not, significantly, with the Soviets. In combat in the East, the VS formations were at the disposal of Guderian (again, ironically), and here they gave a good account of themselves, even halting the Red Army advance at Gumbinnen in East Prussia late in 1944 and elsewhere, but in the West they gave up at places like Remagen when they saw the German Army retreat as well. Here, they served under Field Marshals Gerd von Rundstedt, Walther Model, and Albert Kesselring. VS casualty rates were sometimes as high as 70 to 80 percent, while other units panicked and fled. In the East, some 650,000 VS men saw action, but when Nazi Party officials fled at the approach of the Red Army, so did the VS. When the Army left the VS as rearguard units, not too surprisingly, they returned to their homes rather than die in this manner. In the West, some 150,000 VS men served and had helped to man the West Wall fortifications, as well as hold the Upper Rhine, but in the end, the VS had not achieved Himmler’s or Bormann’s goal. It is estimated that a million VS “troops” were taken prisoner by war’s end, and thousands more were killed and wounded. Tags Adolf Hitler, Albert Kesselring, Albert Speer, Battle of the Nations, Berlin, Eastern Front, ernst röhm, European Theater, Franklin D. Roosevelt, General Gottlob Berger, general heinz guderian, Gerd von Rundstedt, Hans Lammers, Heinrich Himmler, Hermann Göring, hitler youth, Imperial Germany, Josef Goebbels, Kaiser Wilhelm II, Martin Bormann, Militia, Nazi Germany, Nazi Party, Operation Valkyrie, Panzerfaust, Red Army, Schutzstaffel (SS), Sherman Tank, Sturmabteilung, Volkssturm, Waffen-SS, Walther Model, wehrmacht.